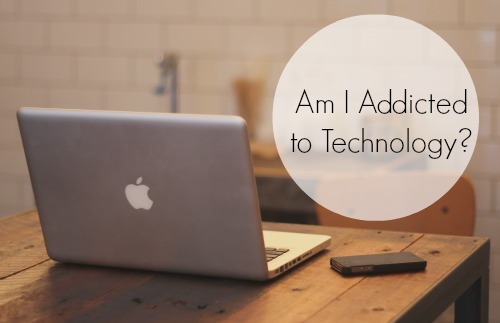 AM I ADDICTED TO TECHNOLOGY? Last week we lost electricity for 18 hours. It was horrible. No air conditioning, no stove. But it almost seemed worse that we didn't have wifi or a place to charge our phones. We were absolutely miserable. Partly because it was so hot, and we had trouble sleeping, but also because we couldn't use any of our things. While I was laying in bed awake in the middle of the night, I started thinking about how sad it was that we were so extremely inconvenienced by this lack of electricity. I mean, people live like that every day. But our lives seem to revolve around our gadgets. All day at work I sit in front of a computer. My entire life is on my cell phone. And when I get home, one of my major hobbies is on the computer. Before this week I had never thought that I was someone who was addicted to technology. But I think there are different levels of being addicted to your gadgets. After seeing how hard it was when I was forced to unplug-- think I might be a little bit addicted. I am going to start spending more time unplugged more often. Instead of spending my mornings in bed checking all my social media, I should just get ready for the day. Instagram and Twitter will still be there if I don't check them 50 times a day. And my life will be a little bit better for it. You are so right! Sometimes I get so annoyed at it, but then when it's not there I don't know what to do! This is one of the reasons I make an effort to plan activities for me and my boyfriend on the weekends. Anything to get us out of the house really. Granted we're still on our phones but at least we get a few hours of just hanging out, enjoying our own lives and not being glued to our phones. Planning activities on weekends seems like a great way to remedy it. I feel like you still need to have your phones, sometimes for safety. Great idea! I'm definitely addicted. And yet, it's been nice to go to the beach or somewhere else out of service and just relax and be present. Working on it! :) being present is always my struggle. I think we might start enforcing no cell phone time at meals and while we are spending time together. Lara do you do this at all with your family?